It's easy to dismiss burgeoning startups that promise to "disrupt" industries or areas of our lives that probably don't need disrupting. Their outlandish and jargon-packed pitches echo obnoxiously in the canyons of the Internet. It's like Tinder, but for vintage neckties! Think of it like Yelp, but for people. It's basically Shazam, for fish! I mean, c'mon. Good luck with that, dude. That's why at first, the prospect of an app that basically makes it easier to hitchhike seems absurd. This is something no one is asking for, right? But here's the rub: the app is already a huge hit... in Europe. It's called BlaBlaCar, and it matches up passengers who need long-distance rides with drivers who are already headed that way. The French ride-sharing app, which launched in 2006, is currently available in 22 countries, and boasts some 25 million members. In startup pitch formula terms, it's like CouchSurfing, but for cars. It hasn't made the leap to the States yet, but if and when it does, it could be a game changer. Users set up a profile, and search for rides based on where they're headed and when. Drivers, conversely, enter their trip details into the app if they have open seats and are willing to pick up passengers. When a passenger finds a match, they request a ride and wait for the driver to confirm. 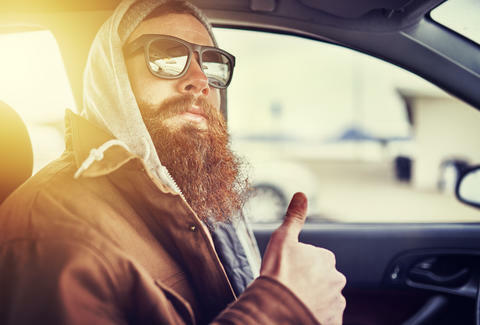 To stave off any concerns that you'll be riding with or picking up someone whose travel plans include turning you into a skin suit, both drivers' and passengers' profiles include reviews from other BlaBlaCar users they've traveled with. Each user's profile also wisely includes a "BlaBla" measurement, which indicates how much they're willing to chat during a trip. As for pricing, drivers set their route price -- mostly to offset the cost of the trip, but they cannot exceed the price limit that the app sets for a given trip. Those limits are in place to ensure that BBC rides are almost always significantly cheaper than any bus or train traveling the same route (especially during times of high demand), and to keep drivers from facing legal or insurance regulations, since they're not technically making any profit. 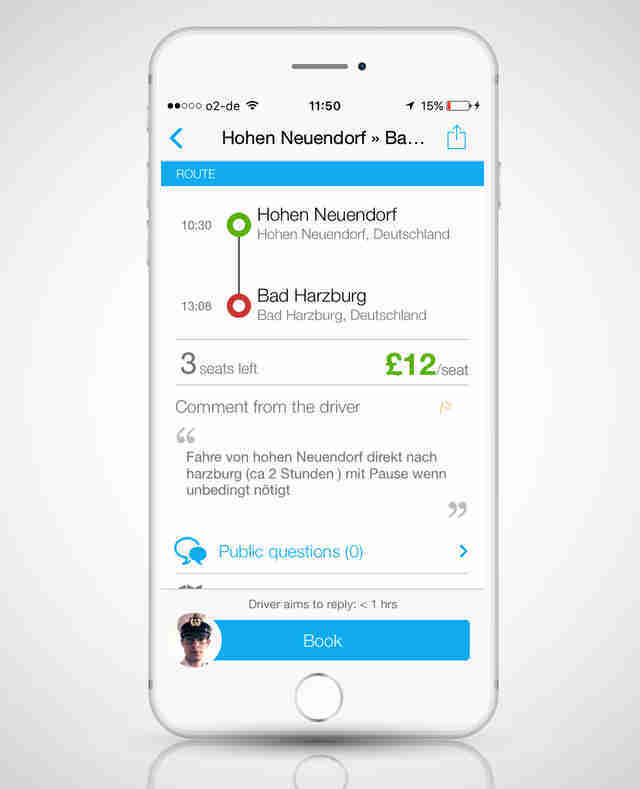 We tracked down a few BlaBlaCar users in Berlin with several long-haul trips under their belts. They all had positive experiences in which BBC came to the rescue -- when they missed their train, had a spontaneous weekend away, or needed to travel on a budget. Only one person had encountered any shadiness, when she discovered mid-trip that her driver had used an alias (a big no-no via the app's terms). "The ride was an old van with blacked out windows. When we started driving, he really wanted to have his car super full, so he started asking people on the street if they need a ride." Red flags notwithstanding, it's ultimately up to you to gut-check the creeps. BlaBlaCar is far from the only ride-sharing or carpooling app out there, but it is by far the biggest. Its success in Europe isn't really about big-budget viral marketing -- instead, the business strategy is to acquire similar ride-sharing services that are already in place in other countries (like Italy, Poland, and Ukraine) and thus, automatically pick up hordes of new users. 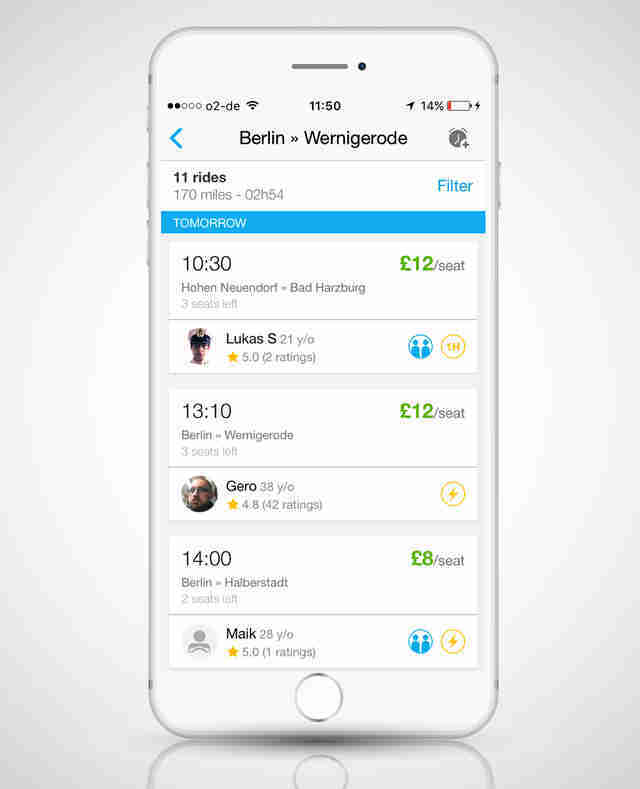 When it came to Germany in 2014, it bought the app Mitfahrgelegenheit, which had been operating in much the same manner since the early 2000s. The strategy has attracted hundreds of millions in outside investment; the company is currently valued at $1.6 billion, making it one of the five most valuable startups in Europe. So where does that leave the US? There's a small handful of carpooling apps operating stateside, including Coride and Zimride (which is actually a subsidiary of Enterprise Rent-A-Car). Have you heard of them? Yeah, no. That's the thing: none of them are popular, which suggests that Americans aren't really into hitching rides. We have a unique driving culture here. We love to drive, and we like doing it in our own cars. There's also the issue of geography. In Western Europe, traveling by car between cities, or even countries for that matter, takes a matter of hours -- which isn't always the case in this big ol' nation of ours. BlaBlaCar's success here in the US of A hinges on it finding a niche of users on the East and West coasts, where drives between popular destinations don't take a full day and a half. As stubborn Americans, sometimes it takes us a while to recognize when we're sleeping on something really great. Look at Airbnb and Uber -- before they became the behemoths they are today, they had to clear some pretty significant hurdles: convincing Americans to feel comfortable handing the keys of their homes over to complete strangers and hopping in the backseats of random people's cars. But now that we're neck deep in the sharing economy, a service like BlaBlaCar may be uniquely suited to succeed here. Road tripping with complete strangers? Why not, dude. Joe McGauley is a senior writer for Thrillist, and always down for a spontaneous road trip, as long as you let him DJ.